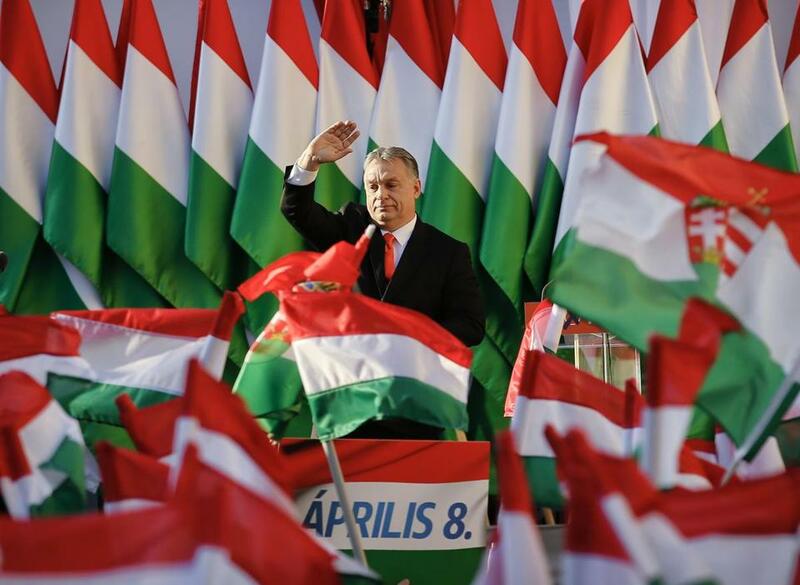 Prime Minister Viktor Orban waves during the final electoral rally of his Fidesz party, on April 6. 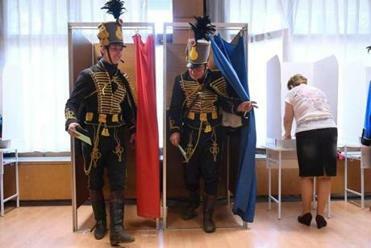 Hungarian voters elected Orban to his third consecutive term and his fourth overall since 1998. The end of Soviet dominion in 1989 conjured an epochal moment in mankind’s inexorable march toward universal freedom. No longer. In Hungary and Poland, autocrats challenge the political and moral cohesion of the European Union, rooted in democracy and human rights. America’s president encourages them. Little wonder. The democratic devolution of Eastern Europe is driven by a nationalism rooted in nativism, racism, and repression. This is a direct attack on the geopolitical glue contemplated by the EU — democracy, transparency, multiculturalism, free trade, and the rule of law — waged by two increasingly authoritarian states acting as cultural enforcers. The all-too-familiar causes — economic dislocation and the fear of nonwhite immigration — are exacerbated by factors rooted in the history of Eastern Europe. As of 1989, Hungary and Poland — like many of their neighbors — had little experience with truly democratic institutions. Their independence and national identity had been repeatedly threatened, most traumatically by Hitler’s Germany and Soviet Russia. The global economy opening before them was a novelty. In freedom’s wake, many progressives in both countries heard the call of the West, reducing their pool of young and talented citizens. Those remaining were older, ethnically homogenous, and strangers to multiculturalism. If the subsequent stream of nonwhite migrants threatened the populace of Western Europe, among their Eastern neighbors it triggered outright panic. This fear soon expanded to include Muslim refugees — and their presumptive sponsor, the EU. The first and fiercest reaction, in Hungary, was spearheaded by Viktor Orban. The charismatic Orban advocated “illiberal democracy” to defend “Christian values” against external and internal enemies — including free-market capitalism, demographic openness, global institutions, and the liberal media. Much like Vladimir Putin, Orban is constructing an autocracy built on nationalism, patronage and crony capitalism. When, in 2015, he erected razor wire border fences to repel refugees from Syria and the Middle East, xenophobia became his most potent rhetorical weapon. The victory will likely permit Viktor Orban’s government to continue with democratic backsliding. The ugly result combines anti-Muslim appeals with a barely-concealed anti-Semitism targeting the Hungarian-born philanthropist George Soros — Orban’s symbolic Jew. Orban’s recent reelection campaign relentlessly focused on repelling immigrants — a threat which has subsided — and attacking Soros as their diabolical patron. Among its rancid features were doctored campaign posters which graced Soros with an exaggerated nose, and depicted him with opposition leaders who have just cut through a wire fence. Like past xenophobes and anti-Semites, Orban deploys these tropes to accumulate power. He has emasculated the judiciary and rule of law; purged the government of Jews and liberals; banned critical media; restricted press access to governmental affairs; and declared war on foreign-funded NGOs. Notably, he is moving to expel Central European University, Hungary’s most highly ranked school – one founded by Soros. And Trump? Orban celebrated his inaugural by proclaiming: “We have received permission from . . . the highest position in the world.” Indeed — Trump calls Orban “strong and brave.” With similar moral discernment, Trump praises Poland’s current regime – which, in essence, is Hungary minus Orban’s corruption. As with Orban, Poland’s enemies are immigration, the mal-distributed fruits of the global economy and, therefore, the EU. Similar are the supposed antidotes: repelling immigrants, repressing the media, gelding courts and judges, and replacing genuine democracy with authoritarian nationalism. One remarkable feature is legislation criminalizing anyone who states that Poles were complicit in the Holocaust — despite irrefutable evidence of Polish collaboration — reserving its harshest penalties for those who refer to concentration camps like Auschwitz as “Polish death camps.” In Poland’s past, one supposes, there were no pogroms. Sadly, these two countries form a dagger aimed at the EU. In admitting them, the EU imagined that creating democratic institutions would implant democracy. Then came the 2008 financial crisis and mass Muslim immigration. Combining free-market capitalism with the forms of democracy did not, it transpired, secure democracy. While casting the EU as a hostile “empire,” Poland and Hungary depend on it for massive subsidies. Their goal is not to leave — buoyed by the burgeoning forces of illiberalism in Western Europe, they mean to transform it. To this challenge the EU brings limited tools. It can pursue economic sanctions. But because any member can veto sanctions against any other, Hungary and Poland promise to protect each other. This threatens an organization rooted in integration, cooperation, and common values. Without these values, it can only deteriorate. One cannot but hope for serendipity — the political failure of the Hungarian and Polish regimes, combined with a sustained effort to address the economic, social, and structural problems besetting the EU — including, most difficult, immigration.